In 40 countries Webpage views from a mobile phone now outnumber those from a PC, according to StatCounter (August 2014). That’s just browsing with mobile phones; if you consider tablet computers to be mobile, then that number increases to 48 countries. Of the 40, three countries stand out particularly being members of the 100 million (mobile subscriber) club: India (797.1 million mobile subscribers), Nigeria (130.6 million) and Bangladesh (116.9 million). And we’re not talking mobile Web being a bit bigger than PC Web – in India, Nigeria and Bangladesh mobile phones now account for around 70 percent of Webpage views. If mobile Web continues to grow at the present phenomenal growth rate, up 67 percent in a year, we should expect to welcome plenty more countries to Mobile Web Majority, as mobiThinking now calls them, over the next year or so. The stats suggest that future additions may include Indonesia and Pakistan, also members of the 100 Million Club. Worldwide desktop access still accounts for 64.6 percent of Webpage views, but the mobile phone’s share has grown massively from 17.1 percent in 2013 to 28.5 percent in 2014 (that’s 67 percent growth). Points to note: a) as shown in the following graph, it is mobile phones, rather than tablets that are responsible for reducing the PCs dominance. This is because the number of people with tablet computers in most countries is still quite small; b) this is just mobile browser access, native/download apps don’t have anything to do with this; c) this is Webpage views, rather than visits. Thus, if PC users visit more pages per visit than mobile users, which is probable, then the proportion of mobile visitors to Websites will be higher than the number of pages visited. The message is stark: companies in all countries need a mobile-phone friendly Website (not just those in countries where mobile has already overtaken PC Web) and, if they want to sell anything, an m-commerce site. “Websites should be preparing for a mobile-first world if they have not done so already. There are huge challenges and opportunities for businesses to adapt to this trend.” Aodhan Cullen, CEO, StatCounter. 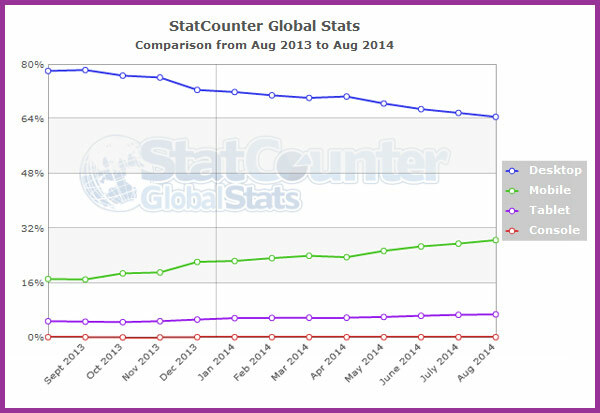 Figure 1: Shares of Webpage views – desktop, mobile phone, tablet and console (StatCounter August 2014). In Western markets such as the US and the UK, PC still dominates Webpage views at 65.6 percent and 62 percent respectively, in August 2014, but mobile is steadily eating into the PC’s share. A year ago the PC’s share in the US was 80.2 percent and UK was 79 percent. So it is possible to see mobile and/or mobile and tablet overtaking PC in these markets at some point. In the following countries mobile Web is bigger than PC Web. The numbers are for the percentage of Web visits from mobile phones. Tablets are not included (for most countries tablet share is remains low). Papua New Guinea (87.13 percent of Webpage views from mobile phones) • Democratic Republic of the Congo (82.91 percent) • Chad (80.94 percent) • Niger (77.54 percent) • Sierra Leone (77.41 percent) • Tanzania (76.83 percent) • Kenya (74.42 percent) • Sudan (74.18 percent) • Bangladesh (72.56 percent) • Mali (72.12 percent) • India (70.45 percent) • Zambia (70.31 percent) • Republic of the Congo (69.7 percent) • Mozambique (69.35 percent) • Malawi (69.15 percent) • Nigeria (68.83 percent) • Zimbabwe (66.61 percent) • Turkmenistan (66.11 percent) • Oman (65.64 percent) • Myanmar (65.38 percent) • Swaziland (64.77 percent) • Lesotho (64.71 percent) • Guinea (63.42 percent) • Uzbekistan (59.6 percent) • Liberia (58.06 percent) • Uganda (56.68 percent) • South Africa (55.67 percent) • Timor-Leste (55.52 percent) • Sri Lanka (54.51 percent) • Kuwait (54 percent) • Burundi (53.76 percent) • Namibia (53.21 percent) • Ethiopia (52.88 percent) • Saudi Arabia (51.22 percent) • Ghana (50.71 percent) • Libya (49.71 percent) • Tajikistan (49.34 percent) • Central African Republic (48.73 percent) • Greenland (47.63 percent). If you combine mobile phone and tablet computer, the following countries are also in the mobile Web majority: Lao Peoples Democratic Republic (47.18 percent mobile phone + 5.35 percent tablet) • Haiti (46.42 + 4.52 percent) • Maldives (46.09 + 4.93 percent) • Gambia (45.79 + 4.91 percent) • Bahrain (44.95 + 5.33 percent) • Lebanon (44.12 + 7.4 percent) • Iraq (44.1 + 6.77 percent) • Angola (43.72 + 6.77 percent) • Brunei Darussalam (42.59 + 11.24 percent).